The growing interest for sustainable fashion and handmade crafts has seen a growing trend of independent boutiques across London. This small and airy shop on Broadway Market in Hackney Central sells sustainable fashion from environmentally and socially conscious brands as Tomorrow, Matt & Nat, People, Treat, Veja… Every item are ethically and consciously made. 69b looks quite small from the outside, but don’t let the tiny showroom fool you. There are additional racks of clothing and shoes downstairs ! AIDA isn’t just a shop selling; it’s a gathering space and a cafe ! Located on the quirky area of Shoreditch, the store focuses on community and connection : music events, artisan classes and sample sales take place through the year. AIDA carries a hundred independent fashion and homeware brands from all over the world - many of which are committed to sustainability : Field Notes, Kinfolk, the Organic Company…The fashion brand Anecdote for instance, produces quality, slow fashion pieces, and each item is made with local materials by family owned ateliers in Portugal, Spain, and Italy. The Third Estate is one of North London’s most lovely gems. 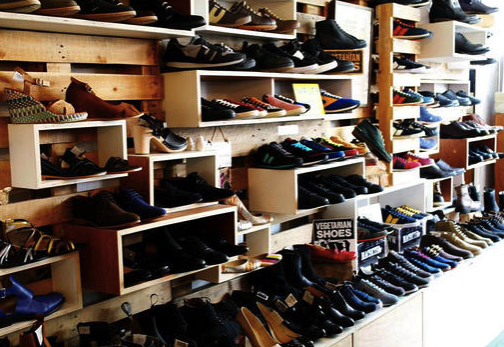 With an entire wall dedicated to displaying vegan footwear, this laid-back boutique is the perfect place to find cruelty-free trainers, dress shoes, sandals, and Chelsea boots. The shop also sells reasonably priced, sustainable clothing and accessories. The Third Estate is located in the somewhat discreet area of Islington, so you probably won’t stumble upon it by chance unless you live in the neighborhood. Even still, it’s worth the trip ! The Keep Boutique is a shop to purchase clothes you will keep ! Located in the popular Brixton Village, Londoners who live south of the Thames will be pleased to find this shopping space perfect for ethical and affordable clothing items. Since the opening in September 2012, The Keep Boutique promotes sustainable fashion brands for women and men that have a story and that will last. « Soft. Light. Dreamy » These words come to mind when wearing an organic cotton shirt created by Henrietta Adams, a London-based designer and the founder of the store Henri. Henri makes women’s shirts committed to longevity and sustainability. Every London woman needs a shirt by Henri, and while the label does not have a permanent store in the city, Henri frequently hosts pop-ups and attends events across this city. Want to know the story behind the new collection of blonde gone rogue, and get the latest news? Sign up for our newsletter for discounts and more!